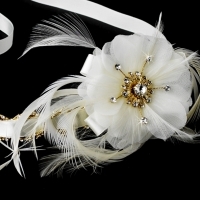 This headband is a lovely reminder of castles and queens, the perfect addition to your classic wedding. 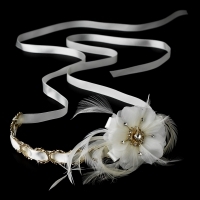 An ivory satin ribbon weaves throughout a golden band, measuring 11" wide, and a charming feather and fabric flower detail, set to one side, measures 3" tall. Rhinestones sparkle at the center of the flower and throughout the band. Size: (Ornament) 3"; (Band) 11"